A new England strip now comes out every year either home or away, and woe betide any fan who steps out in last year's kit. But, as you’ll be unsurprised to hear, it wasn’t always like that, and before football was discovered by the world of marketing, England shirts would go for decades without altering. Caps were the initial way of distinguishing between teams, but by the time of the first international, England against Scotland on the 30th November 1872, caps were no longer used while actually playing, and the England team ran out in white collarless shirts (actually more like thin jerseys) with a three lion emblem on the chest. Shorts were, well, long, actually, becoming knickerbockers and finally, at the beginning of the 20th century, modern attitudes allowed a chap to unveil his knees in public. England shorts were navy, sometimes black, with dark socks. By the 1930’s, as more countries came onto the international scene, an alternate kit for away matches was required. This was particularly necessary for England as so many other teams had chosen white as their shirt colour, and the FA chose red as their alternative. There was also a blue shirt that was used quite extensively, and by this time the three-button collar had appeared on the shirts, similar in the style to rugby shirts. England’s football gear even played a part in the seminal defeat at Wembley in 1953 by the Hungarian national side, the Magnificent Magyars. The 3-6 defeat was England's first on home soil by a team from outside the British Isles and the manner of it, the style and skill of Ferenc Puskas’ side, made it crystal clear that England were no longer de facto the best side in the world. But what of the strip? As the teams walked on to the Wembley turf, the Hungarians in their lightweight boots with cut-away ankles, England captain Billy Wright said to Stan Mortensen “We should be alright here Stan, they haven’t got the proper kit!”The return game in Budapest was worse; the 7-1 rout still on record as England’s worst defeat ever, and for the following season England re-designed their wardrobe. Out went the collars, long sleeves with cuffs and baggy shorts for lightweight, short-sleeved v-neck shirts and close-cut shorts for lower wind resistance and easier movement. In 1964 Umbro began to manufacture England’s shirts and changed them to a round neck, with long sleeved versions being the norm, with short-sleeved lightweight versions for hotter countries. In the victorious World Cup of 1966, England lost the toss to retain their home strip, as the West German strip was identical, so they went out in their away strip of red shirts, white shorts, and, by then, red socks. This clash occurred again in the 1970 World Cup quarter-final and England volunteered to retain the red shirts, hoping luck would be on their side once more. It wasn’t. They tried the same trick in 2000 for the last game at the old Wembley Stadium, against Germany in a World Cup qualifier, and unfortunately it didn’t work then either, and sticking with white shirts delivered the goods in the return match the following year, 5-1. It was Don Revie’s reign that saw the emergence of features that we would recognise today, with splashes of colour and designs other than the three lion’s emblem. The first such shirt sported red and blue stripes down the arms and coloured cuffs. 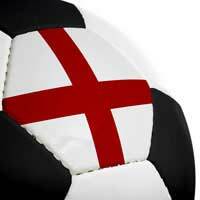 This era introduced bold moves to market the England ‘brand’ for the first time by Ted Croker, the F.A Executive Secretary of the time, who had embarked on an entrepreneurial career after his playing days with Charlton Athletic came to an end. Before this, official shirts had not been available to the general public. This shirt had been made by Admiral and their second shirt for the squad, in 1980, took them further away from an all-white shirt, with very wide blue and red stripes on the top third of the shirt and over the shoulders. At the time it seemed that perms were regulation wear as well, and many an England player went down this ill-advised route in the Eighties. Opinion is divided as to whether or not this was an improvement on the mullets sported with the previous Admiral shirt. It is possible that the perms distracted onlookers from the eye-wateringly tight short shorts that went with that decade. A major change in the Nineties, apart from more relaxed shorts, was the appearance of players’ names on the backs of the shirts. For England the first time this was seen was in a 1992 European Championship bore-draw, at the group stage, against Denmark. As commercialism gripped the game through the Nineties and into the new century we arrive at today’s situation. But the basic strip colours are still white for home and red for away, apart from a few flirtations, for example the ‘grey’ away strip created for Euro 96. The FA insisted it was blue, and in fact, all-light-blue away strips had been worn in 1970 and the early Nineties, so it could be argued that there was a tradition. There had even been a brief flirtation with pale yellow shirts for half-a-dozen or so matches in 1973-4, fortunately discarded in the laundry bin of time. Still, the FA’s marketing must be working, as the results of a study by Warwick Business School, released in 2007, demonstrated that the England strip is the most popular strip purchased by fans in China! Of all the Chinese surveyed who possessed an international shirt, more had England shirts than any other, beating Brazil, Argentina and Germany.So we must be doing something right.